GALVESTON, Texas (May 26, 2016) – Texas Pedal Tours has quickly become a new, unique sightseeing party shuttle of its kind. This eye-catching pedal-shuttle offers tours with a combination of entertainment and exercise. The luxurious pedal deck offers extra comfortable seating for 15 people, USB phone charging stations, Video/ DVD display and a cool misting system for hot summer days. The Texas Pedal Tours shuttle, graphics and logo truly capture the essence of Texas. “The United States flag on the side of the shuttle is to honor all military, law enforcement and first responders who proudly protect the freedom that allowed us to build our dream,” said Jeff Longmire veteran and owner of Texas Pedal Tours. 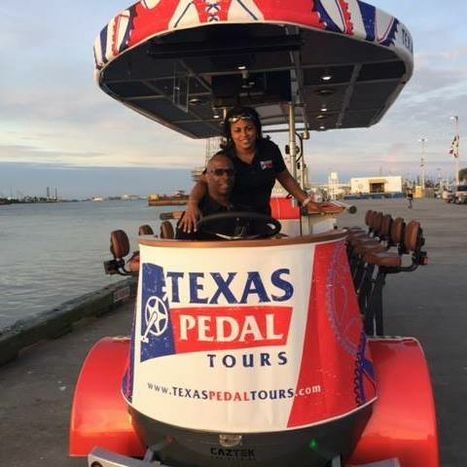 Texas Pedal Tours offers a variety of public tours and private tours. A popular tour is the Taste of Galveston & the World offering tourists the opportunity to visit a variety of wonderful eateries in downtown Galveston. Each customer is guaranteed a smooth comfortable ride always lead by a fun loving Chauffeur and Host. Texas Pedal Tours is easily located at the entry of Pier 21 just outside of Nonno Tony’s Seafood Kitchen and next to Baywatch Dolphin Tours. For more information about Texas Pedal Tours please visit them on their website at www.texaspedaltours.com, by calling 1-877-TXPEDAL or visiting their Facebook page.